Because of the short lifespan, we stress the importance of annual physical examination. Thorough check-ups & preventive care can help alleviate serious health problems. Diagnostic & Therapeutic Services: Our hospital is equipped to provide diagnostic and therapeutic services to care for your pets’ complete health care needs. 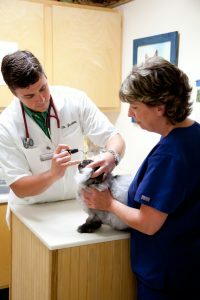 Surgical Services: We offer spay and neutering, declawing, tail docking, tumor removal, and orthopedic procedures. Radiology Services: Our on-site, modern radiology equipment provides high quality radiographs to aid in the quick diagnosis of many disorders. Laboratory: Our in-house laboratory facilities provide for serum chemistry, hematology, serology, urinalysis, and parasite testing. Grooming: Once ever week, our groomer is on site to provide that special look and touch you want for your pet. We also offer: Pharmacy, Individualized Flea Control Programs, Dietary Counseling, Behavioral Counseling, Boarding, Bathing, Emergency Care, & Reproductive Services. © 2017 Mayo Town & Country Animal Hospital. All Rights Reserved.